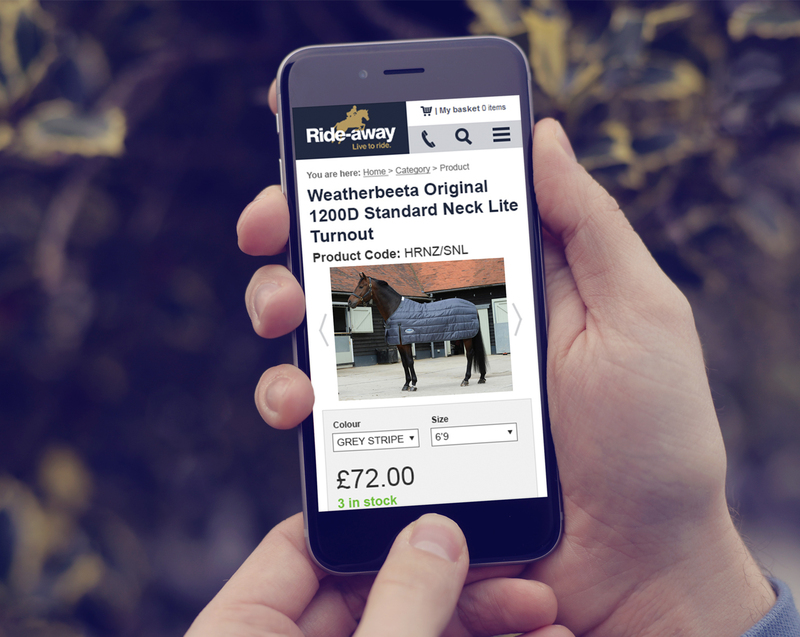 A new multi-channel ecommerce offering for specialist equestrian retailer, Ride-Away - a solution that led to pet supplies giant, Pets at Home, acquiring the business! Acquired by Pets at Home, Ride-Away was established in 1980 and has established an enviable reputation as a leading supplier of equestrian equipment and country clothing. With riding and everything to do with equestrian pursuits having seen a massive resurgence in popularity recently, the company has grown rapidly, employing a team of over 40 staff. Now a household name in equestrian shopping throughout the world, Ride-Away attracts orders from customers worldwide. Ride-Away required a complete redesign of their existing solution in line with customer requirements and brand personality. The company has seen a spike in mobile traffic in recent years, designing and developing a mobile optimised solution was a large part of the project brief. Ride-Away's main aim for the new ecommerce solution was to increase online conversion rates across all devices. Flexible – to allow the in-house team to control all aspects of product presentation from a single web console and support the company’s regular promotions and marketing activities. Effective merchandising functions including a wish list, product customisation, featured products and user reviews. Blog and content marketing zone to allow the marketing team to regularly post updates and develop and online community. Responsive design to provide mobile and tablet browsers with a full optimised online experience. In addition, Ride-Away commissioned PureNet to help them deliver a comprehensive digital marketing campaign, incorporating Search Engine Optimisation (SEO), Pay-per-click Advertising (PPC), Google Shopping Feed and Social Media. “I have lost count of the number of customers who have told me how intuitive and attractive they find the new site, directing them to where they want to go with the minimum of hassle. Christmas sales are well up, and all down to the new website without a doubt!” Angela Clark, Director, Ride-Away. Ride-Away’s ecommerce solution has produced sales growth beyond the targets. The company saw their orders via mobile device more than triple in 2 weeks. Combined with a focussed PPC campaign, the solution has continued to grow. Ride-Away’s continued growth led to the company being acquired by Pets at Home, and subsequent acquisition by online equestrian specialist, Derby House. Ride-away's new ecommerce solution has increased online conversion rates by 15%. An improved online user experience has enabled Ride-Away to grow within its industry and attract new visitors. Ride-Away are now in complete control of their online content and by working together with PureNet, the website has seen a dramatic increase in organic visitors. 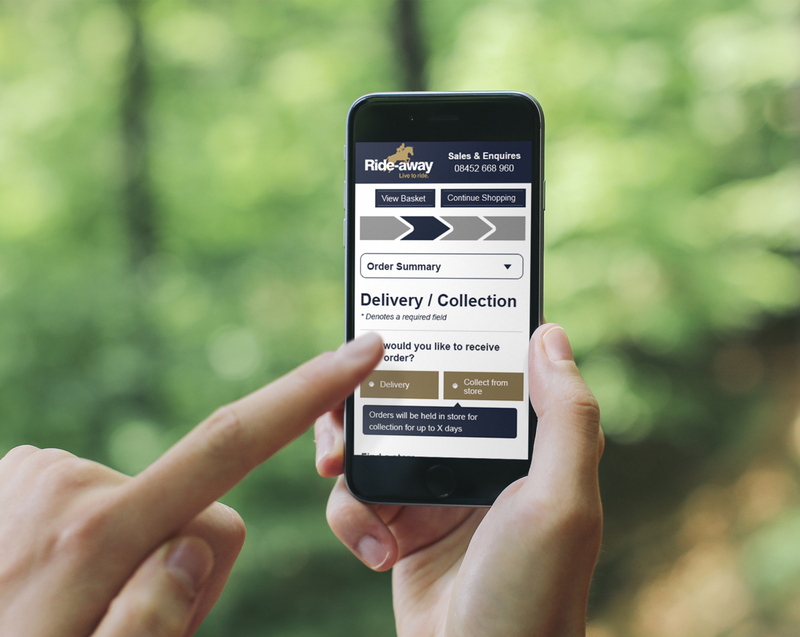 Ride-Away's new mobile optimised solution delivers a feature-rich experience across all devices.